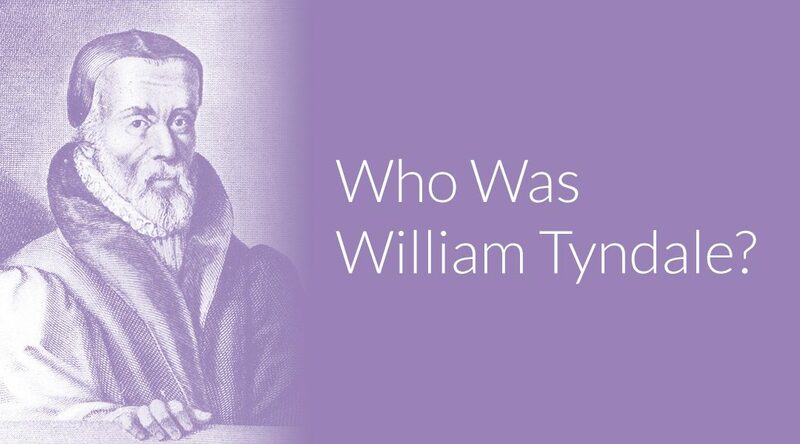 William Tyndale was a sixteenth-century Bible translator and theologian. He produced the first English translation of the Bible from the original Greek and Hebrew. His work played a prominent role in the Protestant Reformation by challenging the papacy’s authority and advocating that everyone should be able to read the Bible, not just the clergy and academic elite. Tyndale’s translation efforts revolutionized the religious landscape of the world. And his subversive theology and open criticism of authority made him an enemy of both the King of England and the pope. Decades after Tyndale’s death, King James commissioned 47 Bible scholars to produce an authoritative English translation of the Bible from the original languages. They consulted existing English Bibles (most of which were based on Tyndale’s work), including Tyndale’s own translation. In the 1611 King James Version of the Bible, the vast majority of the New Testament wording comes directly from Tyndale’s translation. To this day, many Christians around the world have heard and read Tyndale’s words. His choices still influence what people think about God, Jesus, and what it means to follow him. Many non-Christians have probably spoken words and phrases he first penned. So why was Tyndale’s work so controversial? How did he die? What else should we know about him? For starters, let’s cover the basics. When and where did William Tyndale live? William Tyndale was born into a small village in Gloucestershire, England. He lived from 1494–1536, barely making it into his forties. In his early twenties, he enrolled at Oxford University, where he studied for about nine years, earning a BA and an MA. This allowed him to start studying theology, but not Scripture. He became fluent in eight languages: English, French, Spanish, German, Italian, Greek, Hebrew, and Latin. This knack for both contemporary and biblical languages made him an excellent translator. The Protestant Reformation began in 1517, shortly after a German monk named Martin Luther tried to start a conversation about how the church was abusing its power. Around this time, Tyndale studied at the Cambridge University for a few years. By the time Tyndale was born, English Bible translations had already been illegally circulating for about a century. Wittenberg just so happens to be where Martin Luther started the Reformation a few years earlier. It was a bit of a hot spot for controversy. In 1526, Tyndale published a complete English translation of the New Testament. They were publicly burned, which fanned the flames of dissension from the church even as clergy declared Tyndale a heretic. Tyndale’s English translation of the Bible was unlike anything the church had ever seen. And at the same time, the circumstances surrounding it were hauntingly familiar. What was so special about Tyndale’s Bible translation? They were translated from the Latin Vulgate, not the original Greek and Hebrew. One of these English translations, the early Wycliffe Bible, was just about as literal as a translation could get. Out of reverence for the Vulgate, John Wycliffe and his coworkers kept the Latin word order, which “respected” Scripture by turning it into gibberish. OK, maybe that’s too harsh. But it wasn’t very good. Later editions of the Wycliffe Bible smoothed some of this over, but they were still clunky—and more importantly, they were still a translation of a translation. Fun fact: When Saint Jerome produced the Latin Vulgate, part of his mission was to correct the poor Latin translations that already existed, which had retained the word order of the Greek Septuagint. Wycliffe was using the Vulgate to repeat mistakes the Vulgate had corrected. Tyndale’s Bible was the first English translation from the original Greek and Hebrew text. And despite the Catholic church’s best efforts, it was also the first mass-produced English Bible. In 1539, just three years after Tyndale’s death, the Great Bible became the first authorized* English translation, and it was largely based on Tyndale’s translation. In 1611, when King James famously commissioned 54 scholars to produce the King James Version of the Bible, they used almost all of Tyndale’s original translations. *The Great Bible was authorized by King Henry VIII, head of the Church of England—not by the pope. Why did the church oppose Tyndale’s translation? Today, it might be hard to imagine that translating the Bible was a bad thing. But there were many reasons why the church was opposed to it in the early fifteenth century. Some of them had to do with William Tyndale himself. (He made a lot of powerful people pretty mad.) But other reasons took root long before Tyndale was even born. More than a millennium before Tyndale, another Christian scholar set out to translate the original Scriptures into the common language of the people: Latin. Saint Jerome translated from the original Greek and Hebrew, consulted the Septuagint (a Greek translation of the Hebrew Bible), and edited sloppier Latin translations to produce what became known as the Latin Vulgate. The Catholic Church didn’t officially establish the Latin Vulgate as the Bible translation until the Council of Trent in the sixteenth century (well after the Reformation was under way). But Jerome’s work was so highly regarded that the Vulgate was pretty much the only translation anyone used. Even after no one spoke Latin anymore, the words of the Vulgate had become the Word of God. To change those words was to change Scripture. And that’s probably why John Wycliffe’s Bible was a literal word-for-word translation of the Vulgate. And even that made the church mad enough to ban his writings, dig up his body, burn it, and ban all future unauthorized translations. Around the time John Wycliffe produced his first English translation of the Vulgate, he began criticizing the clergy’s theology and practices, and he started what became known as the Lollardy movement. The Lollards disputed Catholic teachings about the eucharist, baptism, confession, salvation, purgatory, fasting, prayers for the dead, and celibacy. Among other things. By what authority did the Lollards dare to defy the Catholic church? The Bible. And how could these “uneducated” people claim to know what the God’s Word said about any of these things? Because Wycliffe put English Bibles in their hands. To make matters worse, a radical priest named John Ball quoted Wycliffe in a speech and expanded his teachings to include criticisms of the state. John Ball’s sermons inspired the Peasant Revolt in 1381, and thousands of people died in a violent conflict—including the archbishop of Canterbury. And voila! John Wycliffe (and by extension, his English Bible) could be blamed for a heretical movement and a well-known violent uprising. But others in the church loathed Wycliffe so much that more than 40 years after his death, they dug up his body, burned it, and dumped the ashes in a river. Wycliffe’s actual translation didn’t have much (if any) influence on William Tyndale’s. But Wycliffe’s work—and the controversial baggage that came with it—was a big reason why the Catholic church was so opposed to Tyndale: they’d seen his kind before, and they knew the damage he could do to their authority. The Lollardy movement persisted after Wycliffe’s death. And in 1408, a synod in Oxford formed constitutions that responded directly to many of the problems the church had with Wycliffe and his followers. They banned all future translations of the Bible, unless they had special authorization. Violators could be charged with heresy. If the church found someone guilty, the state would provide capital punishment. More than 100 years later, this would cause a lot of problems for Tyndale. Fun fact: Since Wycliffe’s Bible was a literal translation of the Latin Vulgate and all editions claimed to be published before the date of the 1408 ban, later Catholic writers in the fifteenth and sixteenth centuries assumed that these were accepted English translations from an unknown Catholic. (Wycliffe’s preface wasn’t printed in some editions.) So they used them. In 1528, Tyndale wrote a book called The Obedience of a Christian Man, which criticized Catholic leaders of holding Scripture captive and intentionally keeping the public in the dark about what the Bible said. Tyndale argued that by continuing to “preach” from the Bible in a language people couldn’t understand, the church had effectively stripped Scripture of its life-changing power. The Catholic church had several reasons to oppose Bible translation, but none of them were good enough for Tyndale. The strongest argument was that if everyone could read the Bible, interpreting the Bible would become a matter of opinion, not doctrine. Without proper training or understanding of tradition, people would form their own ideas. Instead of one agreed upon understanding of Scripture, there would be countless perspectives on what the Bible meant and how it should be applied. It would undo centuries of work to establish Christian doctrine. Tyndale disputed all of the church’s arguments and repeatedly asserted that Bible translation was the solution to misunderstandings about Scripture, not the cause of it. He also took some swings at church leaders for abusing their power in other ways. The Obedience of a Christian Man also famously suggested that a king should be the head of their country’s church, not the pope. The Reformation was already underway by this point, but this book made things much worse for the Catholic Church: it motivated King Henry VIII to create the Church of England. King Henry was unhappily married to Catherine of Aragon, and he wanted the Pope to let him officially divorce her so that he could marry Anne Boleyn. This was at least partially motivated by the fact that Catherine had been his brother’s wife before he died, and their marriage was criticized as a violation of Leviticus 20:21. The pope refused to annul the marriage. But King Henry and Anne were determined to legitimize their relationship, and Anne had a copy of The Obedience of a Christian Man. She told the king to read it. Over the next few years, King Henry and Anne schemed. He banished his wife from court, kicked her out of her rooms, and gave them to Anne. Then the archbishop of Canterbury died, and he appointed a new archbishop who supported annulling his marriage to Catherine (and would later support King Henry as the head of the church). The pope approved the appointment, oblivious of the king’s plan. The new archbishop annulled King Henry’s marriage to Catherine, and after a secret wedding ceremony, he legitimized the king’s marriage to Anne. Then in 1534, King Henry VIII officially established the Church of England, split from the Catholic Church, and declared himself the Supreme church authority in England. It wasn’t exactly what Tyndale had in mind. In 1530, Tyndale spoke out against the proposed annulment in The Practice of Prelates, claiming the annulment would go against Scripture. So basically, he made everybody mad. Over the next few years, Tyndale wrote, continued translating the Old Testament, and improved his translations of the New Testament. During this time, he befriended a man named Henry Phillips, who had recently gambled away a bunch of his father’s money. Henry was one of the only people Tyndale allowed to see his writings. In 1535, Henry betrayed Tyndale and handed him over to Belgian soldiers, who threw him in prison and charged him with heresy. After a months-long process, the church stripped Tyndale of his priesthood, condemned him as a heretic, and passed him to the state. Then they tied him to a stake, strangled him to death with a noose, and burned him alive dead. A few years later, King Henry VIII authorized the Great Bible, an English translation based on Tyndale’s work. There are a lot of words in the Bible. And as Tyndale translated from the original languages, he occasionally had to invent new English words and phrases—many of which made their way into the 1611 King James Version of the Bible, and by extension, centuries of art, literature, and common speech. But Tyndale didn’t just give the world a few new words. He told the English-speaking world what the Word of God sounded like, and his choices reverberate into our hymns, sermons, and very lives to this day. William Tyndale criticized the church and state alike, and openly defied any authority that he believed was out of alignment with Scripture. He was executed as a heretic. But he died advocating for Protestant beliefs. He was both a Catholic heretic and a Protestant martyr. Whatever Christian tradition we come from, we can’t help but encounter Tyndale’s influence. It’s hard to say what our Bibles would look like today if it hadn’t been for Tyndale. Maybe if he hadn’t stood up to the powers that be, someone else would have taken up the charge. Maybe decades, or centuries later, the church would’ve authorized English Bibles on its own. Or maybe the lack of resistance would’ve allowed the church to make its stranglehold on Scripture permanent. And we’d all still be listening to the Bible in Latin. Great history review! Thank you. Studies have been done on business records from the middle ages and they are steeped in Scripture. Your article is a bit slanted and presumes things that simply were not so. I’m not sure I follow. Are you implying that the general population had access to Scripture in English prior to translators like Tyndale and Wycliffe? And by “a bit slanted” do you mean that this overstates the significance of Tyndale’s work? Ryan, I meant no disrespect to you or your view. There was a general knowledge of Scripture through the means that were available. Through stained glass and other means, the Church has always taught the faithful the lessons of Scripture and the business records of this bear this out. Your article makes it sound as if defying authority is a good thing, yet God has always placed authority that all should respect, not defy. I suppose this is the part that makes me feel the article is slanted. I wasn’t offended by your comment, and I appreciate the clarification. I didn’t intend to convey Tyndale’s clash with authority that way, and you’re right: architecture and art were constantly communicating the gospel. Thanks Ryan. I am enjoying our discussions here and elsewhere. You have made a vague and ambiguous accusation vs. Ryan Nelson. Please provide a few examples and information that refutes his statements.